Stacey and I have a love for singing. I can’t claim to make a beautiful sound, but I do have a deep and sincere love for singing. My roommates at Dordt College would often give me a hard time for my not so beautiful singing voice, little did they know I would some years later get a Chinese fortune cookie with the little paper inside saying that one day someone would enjoy my singing. Hopefully this “fortune” has come true. Stacey on the other hand can make a joyful sound and she leads us every Sunday night in an English Hymn sing at the Peterfalva Reformed High School. Laci, a guitar playing teacher and dorm parent, faithfully comes to play the guitar for us every week. We have a faithful core of students who come every week to sing with us, to both practice their English and for a love of singing. Some weeks we have up to 25 students who come for the event. 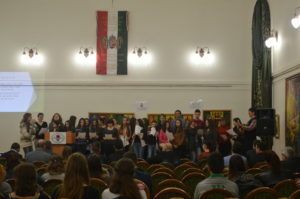 Our little English choir was invited last year to perform at an evangelizing week being organized by a local Reformed youth group at a local college in nearby Beregszasz. We were again invited back this year and once again enjoyed going with our English choir to perform three songs during this church event. May our “joyful noise” be to the glory and praise of God alone!